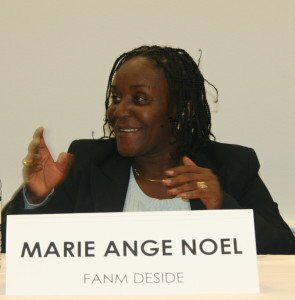 Haiti has a long history of patriarchy, discrimination against women and gender-based violence in the home, at work, in political life and in the courts. Gender discrimination pervades Haiti systematically. This denies women and girls the power to prevent and address injustices against them. HAWG’s Gender & Human Rights Subgroup envisages, advocates for and supports Haitian colleagues’ struggle for a Haiti where human rights, freedoms, gender equity and justice prevail in all areas of life. To contribute to achieving these goals, the Subgroup holds the Haitian government, and bilateral and multilateral aid agencies accountable for harmful investment impacts on women, men, boys and girls. Representatives Levin and Lee led a letter with 104 total bipartisan House members asking Secretary Pompeo to investigate corruption and human right violations by the Haitian government.